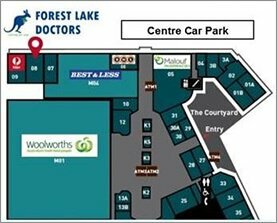 Forest Lake Village Shopping Centre, 8/235 Forest Lake Blvd, Forest Lake QLD 4078, near to Several Pharmacies and many other local amenities available in vicinity. The Forest Lake Doctors is currently participating in the Royal Australian College of General Practitioners’ accreditation program shows that we intend to meet certain standards of excellence. Our doctors here ensure an ongoing commitment to excellent, patient-centered, individualized care that is evidence-based and seeks to be friendly, thorough and meet your needs on an ongoing basis. But, most importantly we ensure our patients benefit from the bulk-billing services (irrespective of whether they hold any concession cards), the permission to book an appointment instead of waiting for hours on end, as well as the ability to book an appointment with their preferred general practitioner or nurse. We’re also constantly working to expand the staff of doctors and nurses for a growing patient list; changes will also be drawn in the opening hours. All our patients have the option of paying for certain services only if they want to; these are value-added private services that mostly remain optional – such as consultations that last more than 10 minutes by a patient’s choice or for consultations that are arranged at times that are not convenient for the General Practitioner, and for paperwork and other items of paperwork. For greater convenience of the patients we let the patients pay through their Medicare cards; also Medicare often change the rebate that they are willing to for certain ideas and services. Further to this, our center is obtaining the card machine that allows for payment of any gap fee with certain rebate almost immediately. Such charges are truly exceptional under most cases and for patients most of the time the services that we offer are fully bulk-billed, bulk- billing becoming the greatest advantage for the patients.